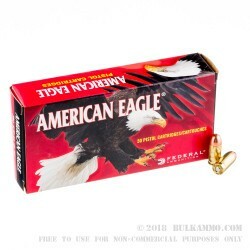 When it comes to trusted names in ammunition, it doesn't get much better than Federal American Eagle. 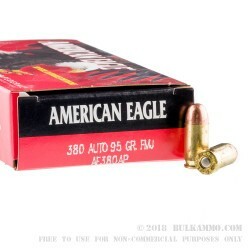 Shooters have been trusting the American Eagle brand for years, and if you are looking for high quality .380 ACP ammo for your next trip to the range, then look no further. 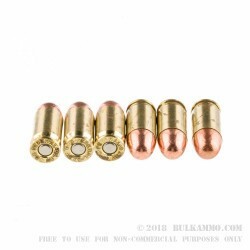 These rounds feature a 95 grain full metal jacket projectile loaded into a reloadable, non-corrosive, boxer-primed brass case. You can expect muzzle velocity of around 980 feet per second. Grab this bulk case of 1000 rounds of high quality American-made ammo, and you won't be disappointed! The shipment was at my door the 3rd day after I ordered. 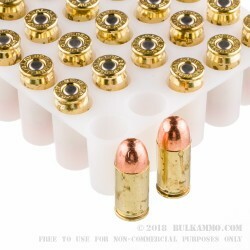 This Federal 380 ammo ammo feeds flawlessly through the Glock 42. Q: What does ACP stand for? Wickipedia suggests Automatic Colt Pistol. A: Automatic Colt Pistol is correct. This term has been used for over 100 years with a lot of history behind it. Today, this does not mean the ammunition must be used in a pistol from Colt. Other ACP calibers may even be used in rifles or carbines. ACP will commonly indicate the ammunition will be used in a semi auto pistol, rather than a revolver. This is important when considering some calibers such as the 32. There is a round designed for both pistols (autos and revolvers) and should not be interchanged. This 380 Auto ammo could also be named 380ACP. Some manufacturers label their ammo with different lettering, but they mean the same thing. Please give us a call or e mail us if there is ever any confusion while shopping for ammo, we will be happy to help!